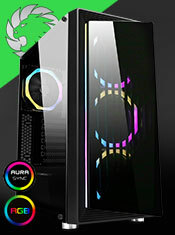 Brand new for 2019 Game Max are proud to introduce the Game Max Crusader with four Game Max Mirage fans included, please note that these four fans are not fitted, it is made with a very simple and classic design, it comes with a tempered glass front panel and an attractive tempered glass left side panel. With the Crusader a PWM hub is included you can control your fans by Choosing RGB SYNC or manual mode, that works in tandem with your built-in PWM hub located behind the M/B panel, which provide normal 3pin fans to share the PWM auto speed function. 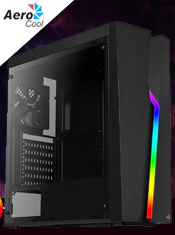 Making this an ideal silent solution for the gaming enthusiast with an excellent cooling solution to help to keep the computer temperature low. The 2 x USB3.0 ports allow the user to connect to most media storage devices. The Crusader can fit up to 5 HDDs, 3 x 2.5" HDD / SSD and 2 x 3.5" HDDs.